This is a great product for in the bathroom. It is gentle on those with sensitive skin. It is also especially gentle with young kids. I will buy this product time and time again for any area with a sink, even the kitchen. I think these really large refill bottles of Softsoap Liquid Handsoap are a really good idea! I usually buy one to keep in my home to refill the soap bottles in our bathrooms, but I think these are especially perfect for work places and schools. It is so much more affordable to buy the big bottle to refill your small bottles. It may take a little bit of work to go around and refill the bottles by hand, but it is definitely worth it. Also, you are able to fill up decorative soap containers instead of using the small store bought, plastic one's. I love that you can also get these in a lot of the different scents and not just one or two to choose from. My favorite scent is the Milk and Golden Honey. It smells awesome and it leaves my hands really soft. I would recommend Softsoap to anyone, especially these large refill bottles. Overall the soap is great and buying in bulk really does save you money! Effectiveness This soap works amazingly and these large bottles of it are great. Scent I love many of the different scents offered, but my favorite is the milk and golden honey. There are many different scents to choose from, so everyone is bound to find one that suits them. This is a good inexpensive hand soap for use refilling a little hand soap dispenser. It is a thick soap and washes dirt off well. It also looks nice in the bottle because it looks thick and shimmery. It is thicker than most hand soaps so I only use it in a soft soap dispenser because it might clog another brand's dispenser. The soap feels nice in my hand and lathers well. I have sensitive skin and this soap doesn't irritate my skin. Effectiveness Good and reliable soap for use in a bathroom or kitchen but not in the shower. Removes dirt, food and even greasy consistencies so I like using it in the kitchen or bath. I think it cleans as well as more expensive soaps. I have bought it repeatedly over the years because of the consistent quality. The soap doesn't leave my skin dry or itchy but also does not moisturize. Scent The scent is faint which I do not like. I think it could smell more natural or modern. A Nice Handsoap that Gets the Job Done! 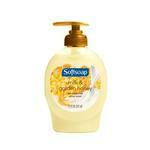 Softsoap Soothing Aloe Vera Moisturizing hand soap is just a wonderful, all-around, nice soap. The thing i really love about Softsoap is that they sell refills, making it a cost-effective option, and the bottles are so simple to refill. The Aloe Vera moisturizing soap is a really thick, creamy soap that adds lots of extra moisture to your skin, while still doing an outstanding job of getting your hands clean. One thing I look for in hand soaps - especially during the winter months - are extra moisturizers to protect against dry, cracked hands and skin. Softsoap with soothing aloe vera really is a lovely combination of a gentle, moisturizing hand soap that can still get the job done. My hands always feel clean and refreshed after using this soap, and even a little bit softer! The scent is great - just mild and refreshing. Overall, a wonderful, budget-friendly soap! Scent It has a nice, refreshing clean scent. It's light and not too strong, but the smell is still there. Makes your hands nice and fresh after washing! Softsoap Soothing Aloe Vera Moisturizing Hand Soap is for me, the best of the Softsoap collection. For years we have known that Aloe helps to bring relief to skin irritations like sunburn, insect bites and minor cuts and scrapes and in this product, these qualities really come together like never before. The cleansing attributes of Softsoap are undeniable. It goes without saying that after cleansing my skin feels clean and refreshed, but it also leaves my skin feeling soft, moisturized and hydrated. The pumps are easy to operate and cheap to refill when emptied. My son responds very well to this special liquid soap because, although he suffers from dry skin and eczema, it replenishes the lack of moisture which is the root cause of eczema. In addition to it being very reasonably priced, the manufacturer regularly places coupons in the Sunday newspapers and when they do, I stock up. A great soft soap and a bargain price too!! I have been an avid consumer of liquid soaps for many years now. I find them far superior to bar soaps for many reasons. They are more hygienic than bar soap, they are less wasteful, they do a better job of cleaning because the liquid gets into creases easier than the bar soap and they are more economical than bar soap. This Softsoap in the large container is definitely a budget conscious persons dream come true! I buy this bottle to keep on hand to refill my smaller pump bottles as they empty. It saves me money and that makes me happy! The aloe in this softsoap does a wonderful job of cleaning and conditioning my hands. I tend to have dry skin that can become sensitive and I find that this soap relieves the sensitivity and softens my hands. Effectiveness This softsoap is very effective at cleaning, softening, and saving me money! Scent The scent of this softsoap is very light and fresh. 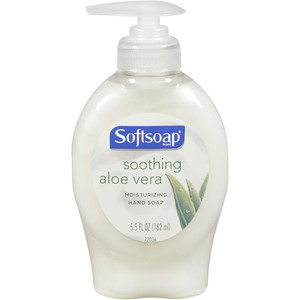 I really enjoy using Softsoap's Soothing Aloe Vera Moisturizing Hand Soap. 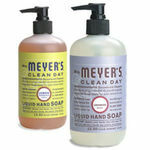 Like its name suggests, the hand soap is creamy and moisturizing. (Well, it is more moisturizing than its regular soaps and definitely more moisturizing than most soap brands, especially in this price range.) And the aloe vera scent is light, clean and soothing. I would recommend it to others. Although, I will say that I prefer some of Soapsoap's other scents, like milk & honey or black raspberry & vanilla. Or at least mix up the scents. And what's great about doing this you'll change the scenery in your house (a little bit), since the soaps come in different cute, little colored bottles. Scent The scent is great. It is light and clean smelling. With that said, I definitely would not recommend buying the big refill bottle of it, unless you're in love with this scent. I made that mistake once and it was truly a chore to use it up. Aloe Vera in any product automatically draws my attention and somehow force me into the purchase. This was one of the two reasons that I purchased this soap and second being that I have been a long time user of Soft soaps. I have almost tried every soft soap available out there. The best thing about Softsoap Soothing Aloe Vera Moisturizing Hand Soap is that it has all the soothing properties of Soft soap along with an added Aloe Vera to it. I purchased this on sale from a nearby store. It is a thick white soap that comes in a small bottle(unless you buy it from Costco). I kept it in my kitchen and my hands felt so fresh after each wash. It would have been the best of the lot if it had some antibacterial properties as well else, this soap exactly does what it says. It leaves the hands extra smooth after every wash and I do not feel the need to moisturize my hands that often. I will recommend this product to anyone who does a job that requires frequent hand wash. This hand soap does the trick for me. Frequent hand washing had left my hands incredibly dry, particularly between the fingers which were white and peeling. Ouch! I switched to this hand soap and my hands felt smoother and softer and my peeling spots healed up fast. This stuff smells really good, just a simple light and fresh scent that lets you know your hands are clean. And they feel sufficiently clean after I use this, granted I do not usually do things like dig in dirt. The only complaint I have about this soap is its consistency. It is very thick and sort of gooey. This means it follows your hand across the sink, leaving a thin line of soap on the counter/sink every time you use it. This is a bit annoying to have to constantly clean up. The thickness also means it gets all over the dispenser and does not look very pretty. But these are minor issues and I still like the performance of the soap enough to continue buying. 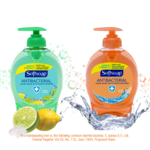 I am crazy about Soft Soap Liquid Hand Soap. I purchase this refill size so I can fill up all the soap dispenser in my home with it. I have used many different soap softs but this has been the best yet. I tend to have a lot of allergies which includes skin reactions to different things, one being soaps. I have had to throw out so many soaps and try again so many so I would not have skin problems as a reaction. There really is not much fragrance which a very good thing for me, nor any problems with the ingredients that would normally react with my skin (rashes, hives, etc.). I always make sure I have an extra container in the house in case we run out before we can purchase a new one. I also recommend it every chance I get as I am so in love with Soft Soap Liquid Hand Soap. Effectiveness It is extremely effective between its cleaning job and keeping your hand soft as well. Scent Not much but I am thrilled it does not effect my allergies.